Description: 9614 steps it up as it prepare to enter the double main. Description: DPU on westbound coal empties. Wonder what's up with the patchwork on the rear there? Description: #885 swings west bound through Dakota MN Friday morning - NICE! Description: A executive leads coal empties east through Gurnee. Description: In this 15 minute 44 second exposure we witness a pair of trains passing under the Ex-ATSF Signal Bridges at CP Gardner on the BNSF Emporia Sub. The train coming at the camera is a westbound, the one with the clear and lighting up the bridge was an eastbound. The westward move showed up about 5 minutes before the eastbound. Description: DPU engine on C-NAMALM. Title: BNSF 6180 Heads up a coal drag down the Fort Scott Sub. 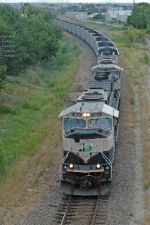 Description: An SD70MAC and a Dash 9 wait with their rock train. Description: A very clean SD70MAC along with a Dash 9 lead a rock train through Irving. Description: BNSF 9614 leads this loaded iron ore train through Mitchell, Illinois at Lenox Tower. Soon the train will park by the US Steel mill in Granite City, Illinois. Description: I cut off the nose so here it belongs. Description: Rolling past the Denison sign into a residential area. Description: Another manifest slinks east at 1744. Description: Built May 1995 as BN 9614.